Montreal's îleSoniq festival is set to return to the city for its sixth edition this summer, and ahead of time, organizers have shared the first round of acts set to play the 2019 event. 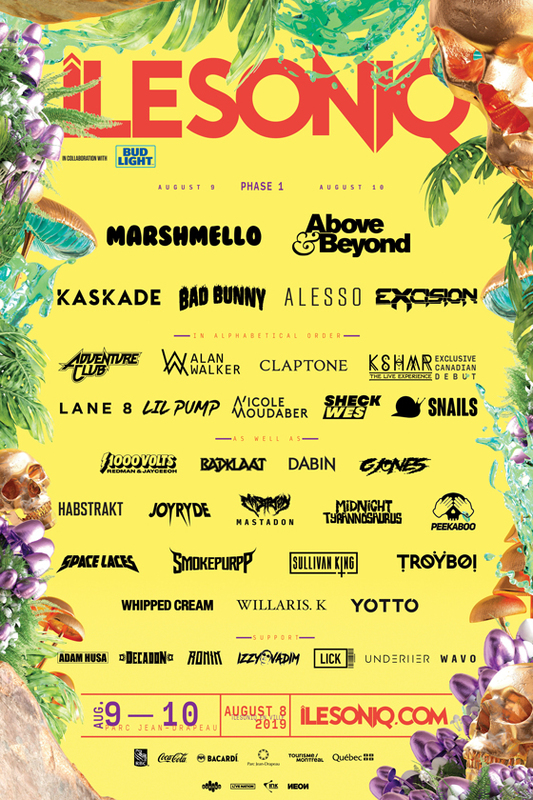 Marshmello and Above & Beyond top the bill, followed closely by Kaskade, Bad Bunny, Alesso and Excision. Additional highlights include Adventure Club, Claptone, Lil Pump, Nicole Moudaber, Alan Walker, Snails and Lane 8. Also performing will be Smokepurpp, Sheck Wes, 1000 Volts, Badklaat, Dabin, Habstrakt, Joyryde, Midnight Tyrannosaurus, Space Laces, Sullivan King, Troyboi, Whipped Cream, Willaris. K, Yotto, Adam Husa, Decadon, Wavo, Izzy Vadim and more. The 2019 edition of îleSoniq will take place August 9 and 10 at Parc Jean-Drapeau. Two-day festival passes are on sale now and can be had for $210. Further ticketing and festival details are available through the event's official website. Watch a preview video below.